Iran’s rising tide of protests continued into June. On June 9th, protests spread to the medical professions. Doctors and dentists walked out of their surgeries, staging a demonstration in front of the Iranian Ministry of Health Treatment and Medical Training. They were expressing their disgust at the regime’s allocation of residency applicants. The regime allocated 60% of residency positions to regime affiliates and supporters. The medical strike was the latest blow to the regime, which is suffering humiliation at the rising dissent and growing protest movement across the country. Nowhere was this more evident than in the “Quds Day” rallies. One individual was seen attempting to set fire to the Lebanese Hezbollah flag in during Friday's "Quds Day" rally in Iran, of course, he was attacked by regime thugs. The regime attempted to drum up public support by holding rallies in Tehran and across Iran. However, public turnout was so low, even with significant editing, the state broadcasters were unable to broadcast footage showing crowds attending the rallies. The clerical regime had advertised the rallies for several weeks, urging citizens to attend. State-operated shuttle and subway services were put on to drive people to the rallies free of charge, yet still, the people stayed away. Among those that did attend were plain clothed Revolutionary Guards and Basij forces to push the numbers up. Even those that depend on the regime for their livelihood avoided the rallies in a show of defiance and protest. The rallies were the clerical regime’s response to protests organized by the Iranian opposition and the People’s Mujahedin Organisation of Iran (MEK). The MEK has called for the public to rise up in solidarity with many of the protests springing up across the country. The President-elect of the National Council of Resistance of Iran, Maryam Rajavi, recently gave the striking truck drivers her full support and called on the Iranian public to stand in solidarity with them. Other protests are sweeping across the country. Retired sugarcane workers at the Haft-tappeh sugar cane company were the latest to join the resistance movement. On June 9th, workers staged a protest over the non-payment of their salaries. They have not received payment for two months and have seen a cut and reduction of their employment benefits. On the same day, steelworkers from the National Group Alloyed Steel Company staged protests of their own. They gathered in front of the Provincial governate, enraged by the non-payment of wages and future job uncertainty. 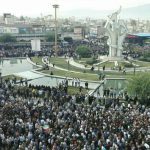 On June 8th, the people of the city of Mahshahr in Northern Iran gathered once more to protest the regime’s plans to divide their city. They gathered in the mosque with banners reading, “we give our blood but not our soil”. In addition to these brave displays of defiance, the truck drivers also continued to vent their frustrations. In Babai freeway, truck drivers parked their trucks, blocking traffic and creating a long queue of stationary vehicles. Each act of protest serves as another defeat to the Iranian regime.